In my most recent post in this series I talked about Beck’s Sea Change, a break-up record felt at first listen, a super-sad extravaganza that came as a wonderful surprise, especially considering its source. I was used to Beck being great musically, ironic lyrically, and weird generally, but rarely authentically sad. 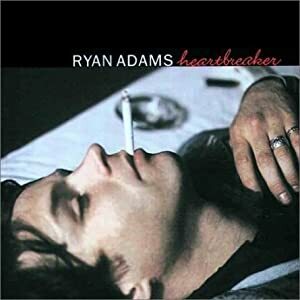 Ryan Adams, on the other hand, is always sad about something, usually girls, break-up records being his forte. Where does all of this sadness come from? Have you ever spent any time in a small southern town like Ryan’s hometown of Jacksonville, North Carolina? These are places where sadness reins, a fundamental part of the environment, hanging there inside the thick, hot, humid air. These are also places drenched with quiet, where the slightest sounds feel amplified, an approaching car moving along a gravel road (Lucinda), the crickets and the bullfrogs calling from the trees in the dark, a lone acoustic guitar from off in the distance, cutting its way through the last rays of sunset. This sad, slow, sparse feel of the rural south is the mood that is beautifully captured on Heartbreaker, with the primary tools of southern folk music, acoustic guitar and trampled-on voice. The opening track, a misleading, fun-sounding, Elvis-like romp announces the subject, To Be Young (Is to Be Sad, Is to Be High), and stands along with the fight-riddled Shakedown on 9th Street (I was just gonna hit him but I’m gonna kill him now) as the two up tempo rockers on the album. As terriffic as these two tunes are, the heart of the set sits in the sparse, country folk of songs like My Winding Wheel, Oh My Sweet Carolina, In My Time of Need and the underground hit of sacraficial-heartbreak-to-the-max, Come Pick Me Up. This album stands up nicely against classics like Neil Young’s Harvest and Nick Drake’s Pink Moon and it is on my list primarily because it I listen to it so much. It’s permanently in my car, and I break it out regularly for long drives. Adams followed it up with the almost as good, but maybe a little bit too long, Gold in 2001, beginning an incredibly prolific decade constituting 10 full-length studio releases. I own and listen to them all, but Heartbreaker remains my favorite, an excellent starting point for anyone interested in Adams and folk-country-rock music at its best. My favorite track on the album is Oh My Sweet Carolina, a harmonious love song featuring Emmylou Harris on backing vocals. Here’s a really super sad version of the song with just Ryan and his acoustic guitar. During my Miles High Artists days I got the chance to spend some time with Ryan. He is very close friends with Jesse Malin and produced Jesse’s 2003 release The Fine Art of Self Destruction, which is a great record in and of itself. Ryan plays guitar on the record and other releases by Jesse including The Heat and Glitter in the Gutter. Ryan’s band, Whiskeytown, was a peer to and competitor with Uncle Tupelo (Jeff Tweedy’s band prior to Wilco) and there exists and underlying rivalry between Ryan and Jeff for tops in the Alt-Country genre. My favorite Whiskeytown album is Strangers Almanac (1997), with standout tracks Inn Town and Everything I Do. Ryan’s solo discography from this past decade is massive, averaging about 1 release per year, and spanning a number of genres, including an all out rock album (titled Rock ‘n Roll). Recently he has been sharing the bill with his touring band the Cardinals. The double disc set Cold Roses, by Ryan Adams and the Cardinals, shows off Ryan’s Jerry Garcia-esque guitar chops and Grateful Dead song writting influences, affects that have been working their way into the longer, generally terrific jams featured in his live shows.